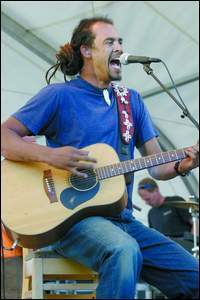 In his recent albums, Michael Franti has not shied away from political commentary. His 2001 CD, "Stay Human," was an indictment of capital punishment and the racism and political posturing that underlie its practice. On 2003's "Everyone Deserves Music," Franti's first post-9/11 recording, the singer-songwriter took more direct aim, with lines like "We got Bush War 1 and Bush War 2; They got a war for me, they got a war for you," from the song "We Don't Stop." Such expressions have put Franti up on the popular music soapbox, as one of the more high-profile musicians willing to mix politics with his art. In his first venture into the big screen, however, Franti makes a mighty effort to sidestep politics. It takes a mighty effort to do so; "I Know I'm Not Alone" is a documentary of Franti's 2004 trips to Baghdad, Israel and the occupied territories of the West Bank. It will screen this Saturday at 8 p.m. at the Wheeler Opera House, and will be followed by a question-and-answer session and solo musical performance by Franti. Franti the filmmaker is interested in something beyond big-picture politics. 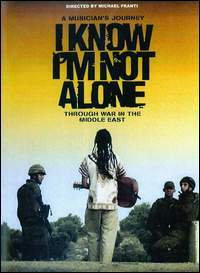 "I Know I'm Not Alone" is not from the talking-heads breed of documentary. There is no authoritative voice commenting on the Iraq War or the decades-long Israeli-Palestinian conflict: no politicians, no generals, no scholars or historians. "I didn't want to make a film that bashes Bush," said Franti by telephone. "I wanted a film about what people face in war. My mission that I want to communicate is not really, stop this war. It's to describe war as a general thing, how it affects the lives of people everyday. So it's a case against militarism in general." To make that case, Franti goes right to the people. Apparently forgoing any formal route into Iraq, Franti, who directed and stars in the film, takes on a pair of taxi drivers as his guides into Baghdad life under American occupation. What he finds is a lot of misery: complaints about the lack of electricity, above all, and the concomitant loss of jobs; curfews and violence that empty the streets at night. Franti's first reaction to Baghdad is to wonder what is that nonstop, high-volume humming that envelops the entire city? It is the sound of the ubiquitous generators that keep the city going (and that contribute to the pollution that one of the taxi drivers, Maher, shrugs off as an unavoidable consequence of electrical power). But Franti also encounters plenty of warmth. If "I Know I'm Not Alone" is not a political, or even especially critical work, it offers a means of hope for a hopeless world. Bearing his acoustic guitar, dreadlocks, a big smile and his 6-foot-6 frame, Franti is welcomed into the homes of Iraqi families, and even more so into the studios of Baghdad musicians. He is seen as more than just a harmless presence, but a benevolent one. The Iraqis portrayed are eager to give their opinions on America and its war in Iraq, and what emerges are thoughtful and nuanced observations. Maher notes the vast difference between the kind Marines and the frightening Army troops. And there is an overall sense that the original invasion would have been tolerated more easily had it not evolved into an occupation (whose third anniversary was marked this week). Franti visits an American military installation to meet and sing to a group of soldiers. As a musician whose anti-war views could be seen as anti-military, Franti calls it the most difficult gig of his life. But even as he sings an anti-war song, he is embraced. Someone tells him that it's not the words he sings that matter most, but that he has come at all, to talk and listen to the soldiers. And it is the same with the Iraqis: Singing a simple tune built around the word "Habibi" - an Iraqi term for a beloved one - Franti is followed through the streets, kissed by men and women, welcomed as a symbol of a desire to come together. "I realized, people in war don't want to hear songs about politics, about how to stop the war," said Franti. "They want to hear songs about connections, to each other, to their families. Because their basic lives are unattainable to them. So the songs I made are of friendship, endurance, tenacity. And love." Probably the most powerful point in "I Know I'm Not Alone" is made through the film's structure. Franti's Iraq excursion is followed by the scenes from Israel and the territories that have been under occupation for nearly three decades. Franti allows the differences between the two situations to speak for themselves. The situations are not perfectly analogous: Israel and the Palestinians, unlike Iraq and the U.S., are neighbors, fighting over the same pieces of land. But the consequences of long-term occupation are evident in the film. The differences become more intractable, and the hopes for bridging those differences become dimmer. Still, Franti finds glimmers of hope. He speaks to Israelis who find the occupation dehumanizing and unwise. Even the Israeli soldiers who man the checkpoints and enforce the rules governing the Palestinians are ambivalent about their task, recognizing both the need for Israeli security and the extent of Palestinian despair that results. 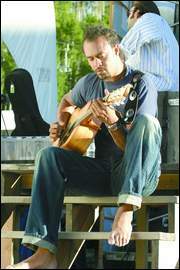 Franti speaks to one Israeli musician, Mosh Ben Ari, who leads multicultural jam sessions intended to foster closer relations between the two sides. "I dedicate all my music to this point, for this problem of Arab and Jewish," says Ben Ari. "We are so much close ... We eat the same food, we are speaking almost the same language, we believe in the same God. ... The problem is only about the political state." That is but one scene built around musical connections. There is also a performance sequence by the Palestinian hip-hop group D.A.M. - Da Arabic Microphone Controllers - rapping skillfully about life under occupation. Franti also visits an Iraqi death-metal band, one member of which eloquently speaks about how glorious it must be to live in America. "This journey really restored my faith in the goddess of music," said Franti, who typically used his singing as the doorway into potentially hostile situations. "Living in America, being a musician, it's really easy to be jaded by the corporate changes in the record industry - the corporate mergers, MTV. But when you go to a place where people are living under duress, you see how music opens their hearts. A traveler like myself is invited into people's houses, or to a checkpoint, to talk to a soldier about his life." But getting an optimistic perspective from Ben Ari, who is already enlightened enough to play with Palestinians, seems like easy pickings. A more powerful scene comes at a checkpoint, where Franti leads a young Palestinian man to an encounter with a pair of Israeli soldiers. There is confrontation, and the airing of the disparate sides of the argument. But the scene ends on a note of connection - certainly not a settling of the battle, but a humanizing of it. And this is the point of Franti's film, to move everyone, on all sides of war, a little closer to seeing the other side. "I learned that I'm not on the side of one group of people or another. I'm on the side of the peacekeepers," he said. A related point that "I Know I'm Not Alone" returns to is the idea that everyone - at least, all the common people - want the same things: peace and security, a job and a home, self-determination and hope. That message is delivered in one of the film's few humorous moments. Sgt. Taylor, who gives a warm face to the U.S. Army, says, "Every morning I wake up and I'm like, damn, I'm still here." From the background, a woman, one of Franti's crew, taking the anti-occupation voice, echoes, "Every morning I wake up and I'm like, damn, they're still here." Despite the we're-all-one message, "I Know I'm Not Alone" never devolves into simplicity. Franti captures the very real issues that underlie the wars and occupations, and says he recognizes that there are no easy ways out. "I still deal with it every day; the complexity is so layer upon layer upon layer and involves so many people's emotions," he said. "To hold and honor everyone's experience is a difficult thing to do. But if we're going to get to a point of co-existence between nations, people who are vying for the same piece of land, the same oil, we have to hold everyone's emotions in our hearts. And recognize that we have to meet in the middle."